Our right hand rings can be used as engagagement rings or as dress rings, depending on your requirements. Also ideal rings for that special occasion sometimes worn on the other hand. Unique and eye-catching, the Odessa diamond bubble ring features an arrangement of five round brilliant cut diamonds, embraced within a flowing band, in a striking and truly individual ring design. Strikingly different, the Odessa diamond bubble ring offers the wearer a unique opportunity to capture attention with a statement ring design. Each ring is crafted to order from your chosen specifications and set with hand sorted G colour SI1 clarity diamonds for maximum brilliance. Set with over 1 carat of dazzling round brilliant cut diamonds, the Madison diamond bubble ring features signature styling, crafted in a personalised choice of precious metal options. Styled with 9 x round brilliant cut diamonds, this impressive bubble ring features 1 carat in total diamond weight, with diamond sizes ranging from 4.5mm (largest) down to 2.2mm (smallest) across a three row design. Set with over 1.50 carats of sparkling diamonds, the Delancey ring design takes on the impressive styling, inspired by diamond bubble jewellery, captivating with dazzling white, eye clean diamonds. This 2-carat diamond ring is stacked with over 2 carats of dazzling white diamonds, the Bowery bubble ring design captivates with an impressive display of natural diamonds held within an exceptional bubble ring design. Spanning 13mm across the finger, the Bowery ring design takes inspiration from bubble ring styles, scattering an impressive show of brilliant cut diamonds across a three band ring design. Enjoy the bold, striking beauty of the Carnegie diamond bubble ring, laden with over 3 carats of sparkling white diamonds. The Carnegie 3 carat diamond bubble ring spans an impressive 15mm across the finger, set with scattered arrangement of diamond sizes in a substantial diamond bubble ring design featuring fully bezel set certified diamonds. Dazzling with traceable Canadian Diamonds, set into 18ct Fairtrade Gold, the Aurora Borealis ring delights in an exceptional flowing design, reminiscent of the Northern Lights of the Arctic Circle. The Waverly diamond anniversary ring combines the beauty of the bubble ring in a uniquely ribbon styled design, set with dazzling white diamonds in a choice of precious metals. 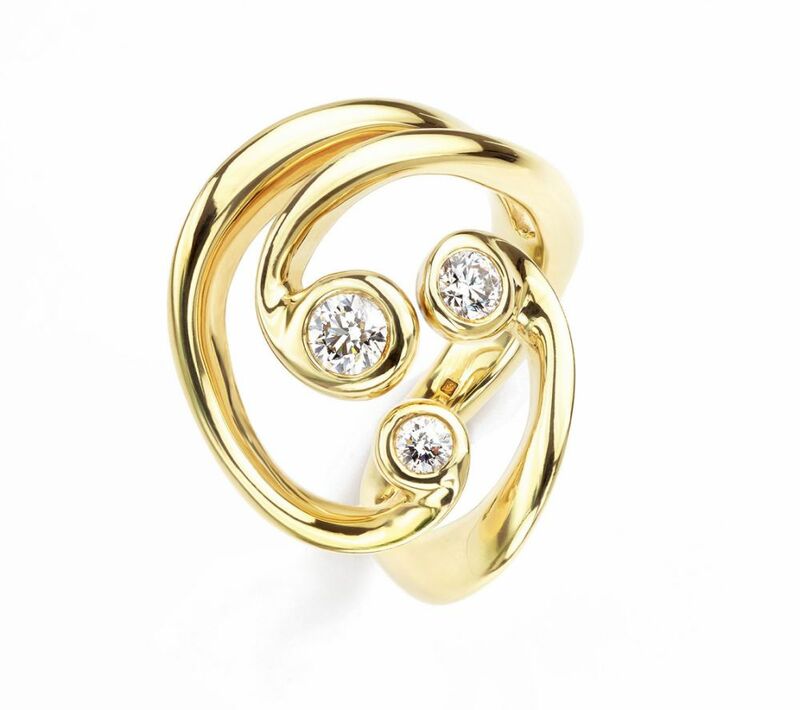 The Waverly diamond bubble ring is crafted from a choice of luxurious 18ct Gold or Platinum. The Waverly ring takes inspiration with a unique twist on the bubble ring, weaving stylised ribbons of gold within a dazzling signature design. Beautifully crafted 5 stone diamond ring featuring elegant square claw settings and a perfectly straight matched set of round brilliant diamonds. Beautiful 5 stone diamond ring design. Features matched round brilliant cut diamonds set along a claw set ring design. Claws are squared to provide the distinctive pattern achieved with the round diamonds, above a court profile band. Choose any one of a number of carat weight options. Please allow 3-4 weeks for completion of this ring. Elegant claw set 5 stone diamond ring with a matching set of 5 round brilliant cut diamonds across a solid court profile band. Traditional design. Claw set with five equally sized diamonds. Solid, straight shoulders. D-shape ring profile. Available in 18ct Yellow Gold, 18ct White Gold and Platinum. Wood boxed. Gift packaged. Approx. 3-4 weeks for delivery. 5 stone channel set diamond ring, with substantial band holding a matched set of 5 round brilliant cut diamonds. 5 stone contemporary design. Five round brilliant cut diamonds, equally sized. Channel setting. Court ring profile. Available in 18ct Yellow Gold, 18ct White Gold and Platinum. Wood boxed, gift packaged. 3-4 weeks for delivery. Diamonds available in diameters 2mm (0.18cts) upto 3.75mm (1.00cts) options. Exceptionally sophisticated Art Deco three stone engagement ring featuring a Carré cut central diamond edged by sparkling baguette cut diamonds. This distinctive vintage-inspired engagement ring offers the unique opportunity for a distinctive three stone setting with incredible charm and attention to detail. Our Deco design features unique, and simple Art-Deco styling across both the setting (see side view for classic Art-Deco fan shaped motif) and diamonds. We specifically use a Carré cut with baguette cut diamonds to ensure consistency and subtle sparkle from this finely crafted ring design. Please allow 3-4 weeks for completion. Beautifully presented as shown. Exquisitely crafted with a natural round brilliant cut Ruby, this elegant three stone ring is brought to life with matching pear shaped diamond shoulders and benefits from a wedding ring friendly setting. This exceptional engagement ring design benefits from an intense red natural ruby held between pear shaped brilliant cut diamond shoulders with the elegant contrast of a rose gold setting against the choice of the Platinum or 18ct White Gold band. Three row diamond ring design, set with 9 round brilliant cut diamonds across a triple band design. Set with 9 round brilliant cut diamonds, this three row effect ring combines elegance with intricate styling. Beautifully finished in a choice of metals, a total carat weight of 1.50cts is achieved across a design which combines 2.75mm, 3.0mm and 3.6mm diamonds part bezel set over a 3.6mm wide band. 1 carat diamond ring with fully bezel set diamonds across a divided 3 band design set with round brilliant cut diamonds. With a grand total carat weight of 1 carat of diamonds, this elegant style of ring delivers sentiments of the Raindance genre of diamond rings. This design features familiar full bezel settings across multiple bands, adjoining the main court profile band that spans the finger. Diamond sizes descend from the largest 0.50 carats (5mm) certified diamond at the centre of this indulgent design. Please allow 4 weeks to create this ring style. Elegant five stone graduated diamond engagement ring with cross-over shoulders. Total diamond weight 0.60cts. (0.10cts of outer diamonds in addition to 0.50cts central certified round brilliant cut diamond selected. Includes central diamond fully certified with minimum Very Good cut grade. Claw setting. Twist styling. Beautifully accented with outer diamonds. Wood boxed, gift packaged. 3-4 weeks delivery. Unique wedding ring friendly cluster ring, set with 4 equally sized diamonds claw set into a wedding ring friendly ring design. Shown with one possible wedding ring design, this simple, elegant 4 diamond ring has a beautiful wedding ring friendly design. 4 equally sized diamonds achieve the carat weight you select, and are claw set above plain shoulders. It generally takes around 3-4 weeks to cast, prepare, mount, set and finish this design to rigorous standards before being shipped beautifully presented as shown below. 4 stone diamond cluster ring, with elegant diamond cluster featuring round brilliant diamonds of equal size above crossover shoulders. Quadrillo 4 stone diamond engagement ring, featuring a diamond arrangement of 4 equally sized diamonds in a range of carat weight options. Diamonds are matched and precision set above a pair of stylised plain crossover shoulders. Delivery time is typically 3-4 weeks for ring creation, setting and finishing, before shipping to your door. Unique flowing wave styled diamond 4 stone ring, claw and bezel set with mixed sizes of round brilliant cut diamonds. Four diamonds of varying size. 0.06cts, 0.10cts, 0.16cts and 0.50cts. Claw set wave design Court ring profile. Available in 18ct Yellow Gold, 18ct White Gold and Platinum. Wood boxed and gift packaged. 3-4 weeks delivery. Conceptual and modern, 4 stone diamond ring set with beautifully matched high quality round brilliant cut diamonds in a futuristic design. This ring design is conceptual, ultramodern and verging on futuristic, with a streamlined shaped that embraces 4 round brilliant cut diamonds, precision set within the ring. With a total diamond weight of 0.70 carats, this style is a beautiful example of modern jewellery making, delivered to you within around 3-4 weeks from ordering. 3 stone diamond ring with partially exposed, ascending diamond sizes across a unique trilogy ring design. Three round brilliant cut diamonds are set within this combination setting ring design. Each diamond radiates with brilliance, as light floods through the partially exposed setting in this very unique ring design. Typically this ring style takes around 3-4 weeks to create, and is perfectly finished before being shipped fully insured to you. Trilogy style 3 stone diamond cluster ring with wave styled tapering solid shoulders and wider court profile band. Optional carat weight for this 3 stone trilogy cluster design. Exquisitely matched round brilliant cut diamonds. Narrow shoulders with wave styling flow from the wider 3.5mm band. Low setting height and unusual modern design. Approx. 3 weeks delivery. Wood boxed and presented as shown in our example below. The diamond Daisy cluster ring is a simple seven stone cluster diamond ring. Crafted with a daisy style arrangement, each ring is crafted to order and features a wedding ring friendly setting, suitable for a simple wedding ring. Discover edge-to-edge sparkle with a magnificent show of brilliance from this elegant Daisy diamond cluster ring. Set with seven beautifully cut round brilliant cut diamonds, each ring is crafted with care and attention to detail during, working to your precise chosen specifications. This dazzling design benefits from a wedding-ring friendly setting which means a perfect fit alongside a straight wedding ring. Daisy is the perfect diamond cluster engagement ring. Graceful, modern and beautifully crafted using 7 round brilliant cut diamonds within elegant full bezel settings. Striking design, Rub over setting in three rows. Set with 1 x 3.5mm, 2 x 2.8mm, 4 x 2.0mm diamonds. D-shape ring profile, Available in 18ct Yellow Gold, 18ct White Gold and Platinum, Wood boxed, gift packaged. Approx. 14 working days delivery. The Rainstorm diamond ring is a 7 stone diamond scatter ring, set with 0.80 carats of round brilliant cut diamonds across a 3 band design with claw settings. Styled for elegance and brilliance, the Rainstorm 7 stone diamond ring offers comfort and luxury in a truly distinctive diamond ring design. Fresh modern diamond scatter ring, featuring mixed sizes of sparkling round brilliant cut diamonds. 0.80 carats of total diamond weight. Claw set diamonds scatter across 3 integral bands of this beautiful contemporary ring design. Please allow 4 weeks for delivery. Luxury presentation box and packaging included with each order. International delivery available to many locations Worldwide. Unique 8 stone diamond bubble ring, set with 0.80 carats of round brilliant cut diamonds across an unusually styled bubble design. Bubble inspired diamond cluster ring. 8 x bezel set diamonds, 0.80cts total. 2 x 4mm diamonds, 2 x 3mm diamonds, 2 x 2.5mm, 2 x 1.8mm diamonds. Solid tapering shoulders. Wood boxed. Gift packaged. 3 weeks delivery. Unique and modern 3 stone diamond engagement ring with a curled triple bezel setting and plain tapering shoulders. 3 matching round brilliant cut diamonds within a triple curled setting . 0.30 carats in total diamond weight. G colour SI1 clarity. Simple and contemporary design. Available in 18 carat White Gold, 18 carat Yellow Gold and 950 Platinum. Supplied wood boxed and gift packaged, approx. 3-4 weeks timescale. 2 part diamond wedding ring set featuring an elegant flowing engagement ring and wedding ring within one amazing design. Engagement ring with 0.25cts round brilliant cut diamond. G colour and SI1 clarity. Melee outer diamonds 0.07cts in addition to this. Diamond wedding ring 0.06cts. Exclusively in 950 Platinum. Please allow 4-5 weeks for finger sizes manufactured to order. Many sizes from stock. Wood boxed and gift packaged. 3 colour diamond stacking rings, with diamonds set into elegant trilogy clusters across 3 colours of rose, yellow and white gold. 18 carat rose gold, yellow gold and white gold rings can be worn as petite rings individually or combined as a set of stacking rings. Total diamond weight 0.36 carats. Probably the most definitive trilogy ring set, with 3 colours, each holding 3 diamonds within a 3 ring set. This design can be ordered in same colour combinations where required. Please allow 3-4 weeks for completion. 1 carat total diamond weight, 3 ring stacking set, with fully bezel set round brilliant cut diamonds, including full certification. Jaw dropping set of brilliant cut diamond stacking rings. Three rings sit perfectly with bezels lying as if this formed just one ring. The largest diamond is a GIA / IGI fully certified round brilliant cut, held within a perfect bezel setting. The combination of sparkling G colour SI1 clarity diamonds within neat, simple settings over the mirror polish of the three stacked rings, provide an exceptional show when worn together. Please allow 3-4 weeks to create this very special design. 3 ring set of stacking rings, precision set with round brilliant cut diamonds in full bezel settings within an innovative stacking design. Round brilliant cut diamonds. Three ring set. Wear singly or as a full set of three rings. Bezel settings. 0.56cts total weight. 8 x diamonds. Largest diamond size 3.5mm. G colour SI1 clarity. Wood boxed. Gift packaged. 14 working days delivery. 0.16 carat sweeping 3 stone diamond ring, with beautifully set round brilliant cut diamonds across a delicate modern ring design. Graceful trailing stems curve outwards to hold each diamond. Contains three varying diamond sizes of round brilliant cut diamond. Rub over setting. Total diamond weight approx. 0.16 carats. This ring design typically takes around 3 weeks to produce, and is beautifully finished with care and attention before delivering beautifully boxed to your door. Contemporary seven-stone diamond ring, set with white diamonds and blue sapphires in full bezel settings. Striking modern design. Arrangement over 3 rows. Includes 4 x Blue Sapphires. Available in 18ct White Gold and Platinum. Please allow up to 14 working days for delivery. Total stone weight specified, includes 0.15cts of Blue Sapphires. Star designed diamond ring, with diamond bursts from fine trailing details within an exceptionally pretty ring design. Beautifully styled, 4 stone diamond ring, set with round brilliant cut diamonds in elegant claw settings. Reminiscent of a shooting star, tapering trails end with a single diamond burst, within an exceptionally pretty design. 1 Carat seven stone 'Rainfall' diamond ring, with round diamonds, bezel settings across a contemporary three section band. An exceptional ring design set with 7 matching round brilliant cut diamonds, dazzling in G colour and SI1 clarity. Exceptionally great value in comparison to similar designs. Full bezel settings hold round brilliant cut diamonds within a substantial solid ring mount. Delightfully styled loop diamond halo engagement ring featuring a dazzling array of diamonds set across each shoulder and within the surrounding loop halo. Enjoy a choice of certified diamond held within the centre of this masterpiece engagement ring along with full diamond certification, a lifetime warranty, 60 days returns and exquisite packaging. Elegant loop styled design, with central certified round brilliant cut diamond. Provided with full diamond certification from GIA or IGI laboratories. Very good cut grade included. Additional 0.33 carats of outer diamonds are provided in addition to the central diamond chosen. Please allow around 5-6 weeks for us to create this ring before shipping from the UK. Wood boxed and provided with insured delivery. What are diamond Cocktail Rings? Cocktail (or right hand) rings were introduced to provide an incentive for purchasing alternative rings that were not specifically intended as rings for engagement or by bridal wear. Since typically, bridal designs dominate the left hand, it seemed a sensible focus to adorn the other hand with diamond jewellery, having a clear message that the piece did not reflect a particular sentiment. Sometimes termed dress rings, or right hand ring, the cocktail ring has become extremely popular for a treat or special occasion, with many women purchasing such a ring for themselves, simply as a luxury product that they can wear without any implication of relationship. We have often been asked why our diamond rings are split into so many categories, but simply put, people search by many different categories, so it is essential for us to band designs into as many appropriate categories as possible, and to ascribe to these designs as many suitable ring styles as we can. Whether you are wearing such a ring on the left or right hand is of no particular consequence, but the reason for this style, as with any other is completely down to personal motivation.